When I thought about making this for dinner, I didn't think much of it. But, by the time I finished chopping everything, I knew this would be a good one to blog and save for later. 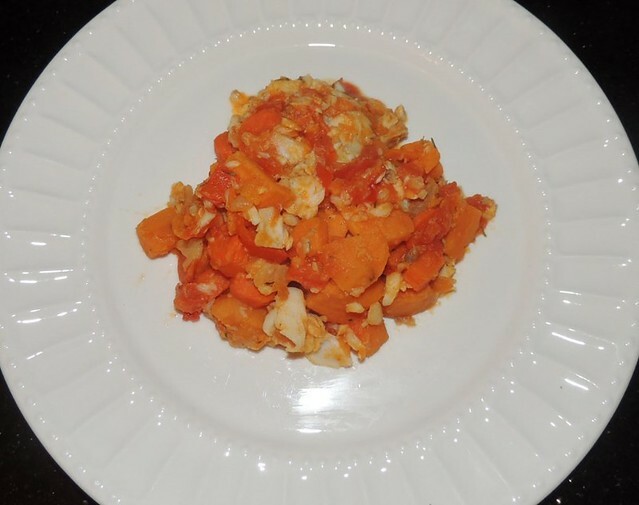 In fact I was going to use the regular potatoes before it occurred to me that I had some sweet potatoes I was saving for Eliana. When I think about it now, we rarely eat sweet potatoes. That's about to change. The only person that gets a good dose of sweet potatoes is Eliana. As usual, I was driving home from work thinking about what's for dinner. I wanted something quick, 30 minutes or less meal. At first I thought about pan seared fish with some veggies and what? We've had rice this week, we're out of quinoa and I don't feel like stopping at the store to get any. Roasting regular potatoes will just take too long and too much work than I want to do. I was about to give up and just do fish and veggies went I got this idea, how about a one-pot dish! That's how I ended up with this dish. Like I said above, I knew this will be a hit as I finished the prep work. I said to myself Eliana can even eat this, until I finished and realized I made it too spicy. The times when I'm keeping her in mind, trying not to make the food not spicy is usually when it ends up spicy. She's pretty good with spice but this is no match for her. Maybe on the next one. 1. Heat up olive oil in a pot on med-low heat. 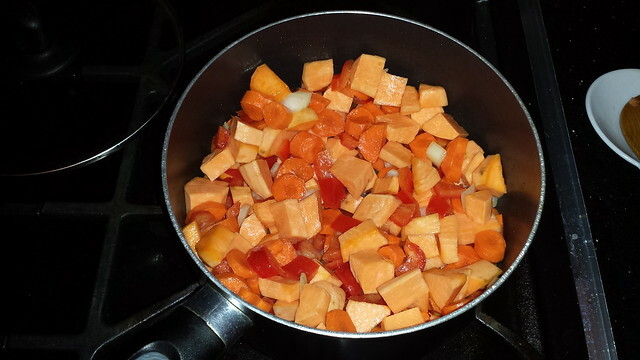 Add diced sweet potatoes, carrots, red bell pepper and onions. Cover and let's cook 7-10 minutes or till potatoes starts getting soft stirring frequently. 2. Add tomatoes and all other condiments. Stir gently till all ingredients is well blended. 3. Add fish fillet and stir slightly till fish is about in the middle of the potato mixture. 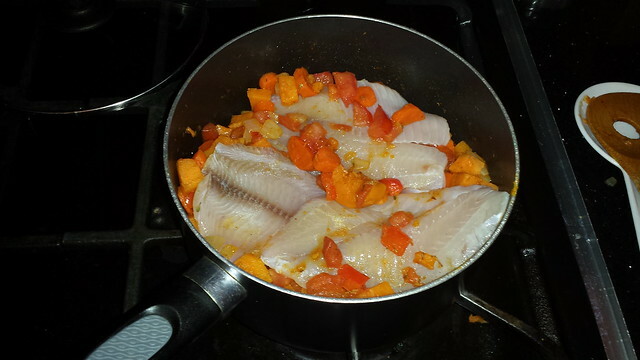 Cover and let cook for another 3 to 5 minutes or till fish is fully cooked. 4. 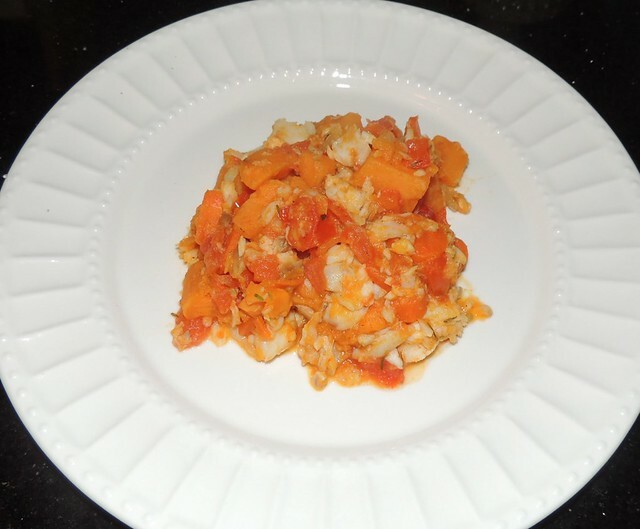 Gently using a wooden spoon, mash/break fish into pieces, mix well to combine with potatoes. Remove from heat.